This title seems like clickbait, doesn’t it? And it seems like this would be the part where I say something about a pyramid scheme or transferring credit card balances, right? The truth is both more (and less) exciting than that. I found our looks-like-new, should have been $900 living room sofa, our beautiful, mission-style end table and every single plant or flower in our yard … in the free section of Nextdoor.com. If you’re not familiar, Nextdoor.com is a social media platform for your geographical neighborhood; it’s like Facebook for your zip code. 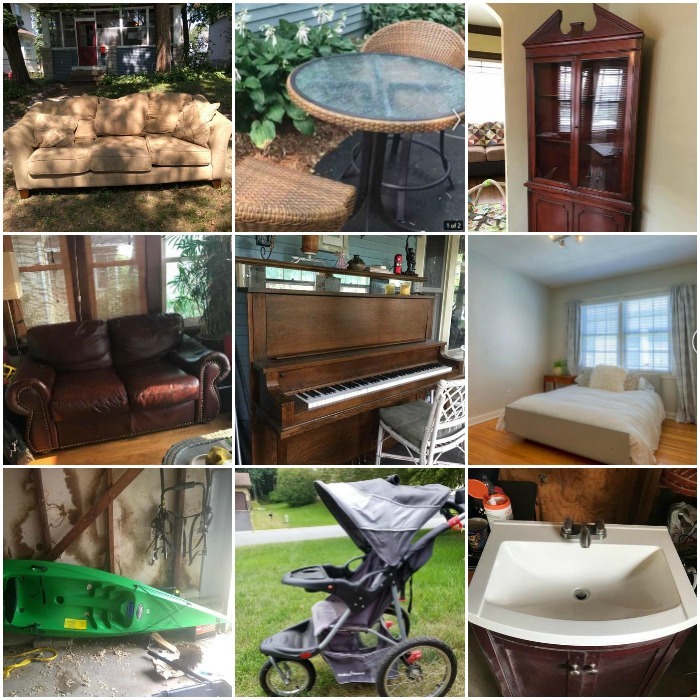 It’s commonly known as the space where neighbors bicker about speed bumps and post about lost pets, but earlier this year I discovered that it was also a treasure trove of surprisingly nice, free stuff. In fact, here’s a tiny sampling of things that were given away – for free! – in the two days it took me to write this blog post. So why would people give away such nice stuff? Honestly, most of people simply can’t be bothered to sell their stuff! They don’t want to haul anything to Goodwill. They don’t want to email back and forth with strangers from Craigslist. They don’t want to post a price of $40 and then spend the day haggling over text with someone who wants to pay $30. Isn’t it just easier to put it in the alley and let someone else enjoy it? Yes. And for those of us willing to drive a mile and load a coffee table into our hatchback, this is great news. It’s free! What do you have to lose?! If you don’t have a dehumidifier and the free one you got from a neighbor works 90% of the time, isn’t that better than having zero dehumidifiers? Isn’t it better to mow your lawn with a free mower than not mow it and get a fine from the city? If the grill you get off Nextdoor doesn’t turn out to be your Forever Grill, you are out exactly $0 and the 15 minutes it took to pick it up and bring it home. Let’s say your dream couch is a $1,800 cream-colored number with mid-century lines and beautiful, tapered legs. But if you wanted to buy said couch, you’d have to put it on your credit card and pay it off over the course of the year with 17% interest. Maybe you should just get a totally serviceable, not-ugly free couch from Nextdoor. Use it for six months while you save up to buy your dream couch in full! And just a “I know nobody wants to hear this but we’re talking about it anyway” side note: with the exception of vehicles, houses, and college educations: if we can’t pay it off at the end of the month, we can’t really afford it. So find a free, great-for-now solution til you can afford your perfect purchase. Your future self thanks you! We got our sofa from people two streets over – a lovely couple we wouldn’t have otherwise met. Now when I see them on my morning walks with the dog, we say hello and they laughingly ask after their couch. I’ve picked up three different types of perennials from the same woman as she re-landscapes her backyard. I’m sure it’s only a matter of time till I’m sending her photos of my yard and asking for advice. In a city sometimes known for being insular and aloof, these little interactions make Minneapolis seem smaller, friendlier, and safer. Buying a new grill, patio set or Ikea sofa seems great until you realize that it comes in a box and the next six hours of your life will be spent with an Allen wrench and a poorly written instruction booklet. I swear to God, avoiding the assembly process is reason enough to buy everything secondhand. Greg at 7846 33rd Ave. W. isn’t going to give away a bedbug-filled mattress because anyone who takes it a) knows where he lives b) knows that he’s active in an online community where he can be called out. The non-anonymity of Nextdoor removes many of the less-than-great aspects of getting things secondhand or free. Pretty much everything that is posted is in working order – and if not, that’s clearly noted. There’s less pet-destroyed furniture and fewer abandoned, half-finished projects simply because people are too embarrassed to let their neighbors see that stuff! Most of the sections on Nextdoor are limited to your geographical neighborhood. I won’t get crime alerts from Northeast Minneapolis or see what people in Uptown are saying about a specific landlord. But! The ‘free’ section spans the whooooooole city – including the high-income areas. So when someone in Edina posts their two-year-old Room & Board sofa in the free section, I can see it. When someone on Lake Minnetonka is giving away a mid-century bedroom set because they can’t be bothered to sell it, I can see that, too. Many of the things I see listed on Nextdoor for free could be sold on Craigslist or Facebook Marketplace – often for hundreds of dollars! So if you have free time, an eye for what sells, a vehicle that’s good for hauling, and enough storage space, I’m sure you could make a side hustle out of this! Wipe things down, add a fresh coat of paint, good photos, and a clever, keyword-filled description and you could easily bring in a few extra hundred dollars each month. More people = more free things. Of course. If you live in a small town, it’s unlikely your Nextdoor has a hopping free scene. If you live in L.A. or New York or Dallas, I imagine you’d have more free things than you can handle. According to the statistics on my dashboard, 55% of the 1,609 households in my neighborhood use Nextdoor. Based exclusively on anecdotal evidence, that’s higher than some other large cities. Just because you live in a big city isn’t a guarantee that it’ll have an active Nextdoor community. But it doesn’t hurt to join and find out! I’ve encountered people who want me to call them on the phone before they’ll give me two day lilies. One woman gave me her address and said I could dig as many hostas out of her backyard as I wanted. She was not home. Other people pile furniture in their driveway, publish their address, and let you hash it out. Will the dresser you want still be there by the time you drive to Chanhassen? Who knows?! A good rule of thumb is: The more recently it was posted, the more likely that it’s still available. If it’s the sort of thing that would require you to enlist a friend or rent a truck, obviously make sure it’s still available. The more awesome the free thing is, the more likely a bunch of people want it. Understandably, most giver-awayers aren’t particularly interested in holding on to something or exchanging a million emails so you can come take something off their hands. You can improve your odds by sorting the results to ‘newest first.’ You might consider saving the ‘free’ page as a favorite on your phone and check it a few times a day, if there’s something specific you’re looking for. You’ll also find that the free section is much busier on weekends, when people are cleaning out the garage or having yard sales. So be sure to check then! Have you ever stayed in a hotel? Sat in a booth in the VIP section of a club? Congrats! You’ve encountered more dead skin cells and bodily fluids in either of those places than in your neighbor’s two-year-old loveseat! If you’re really concerned, rent an upholstery cleaning machine or just buy some Woolite upholstery cleaner and use your vacuum attachments. It’s totally fine! I promise! But I want to hear from you! 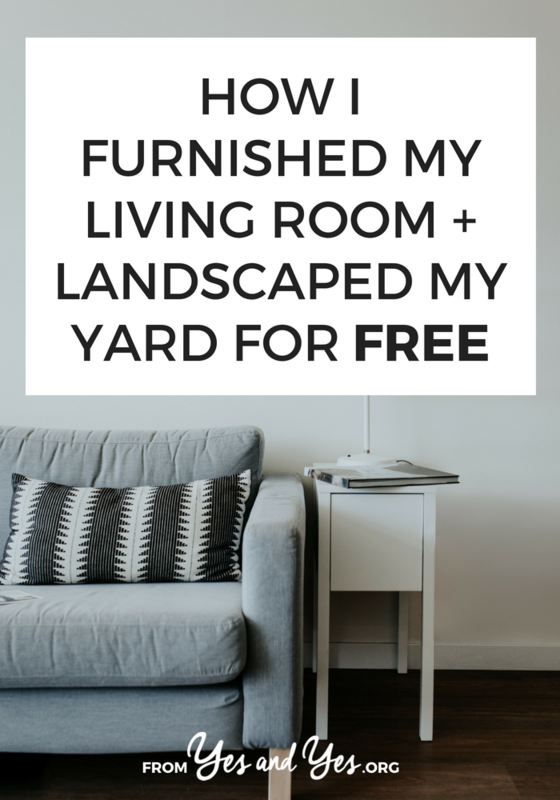 Would you ever take your neighbor’s free stuff? What do you do with things you’re not longer using – do you sell them or just put them on the curb? P.S. This is not a sponsored post, just a discovery I wanted to share with you! That being said, if you work for Nextdoor and you’re reading this OMG EMAIL ME AND LET’S COLLABORATE I HAVE SO MANY IDEAS FOR YOU. I’ve never heard of this website but this is EXACTLY up my alley! (kekek) Thank you for sharing. Oh, yes! And Craigslist free can be decent, too! I’ve been finding a lot (like, a LOT) of free animals on Nextdoor locally, which makes me sad. I’ll have to see if there’s some way to filter out those posts so I can just watch for free furniture and whatnot! Same. Those are so heart-breaking! freecycle in Minneapolis is great.